Among his various ventures, Kotkin is the executive editor of New Geography, where I post articles from time to time. I started writing for NG when Kotkin emailed me after I had taken issue with some of his ideas, and asked if I’d be interested in writing for the site. This made me start paying closer attention to his work. What [the suburbs] have failed to do, often miserably, is to live up to their promise of becoming self-contained, manageable communities that can both coexist amiably with the natural environment and offer a sense of identity. The prospect of a nation crisscrossed by ugly sprawl corridors like Lee Highway in Virginia or Interstate 10 between Los Angeles and San Bernardino may be too gruesome to contemplate….The great challenge of the 21st century — not to mention the main economic opportunity — lies in transforming suburban sprawl into something more efficient, interesting and humane….the suburbs need to evolve from a pale extension of the city into something more like a self-sustaining archipelago of villages. This isn’t totally dissimilar to the goals of those new urbanists who seek to retrofit suburbia into more sustainable communities. 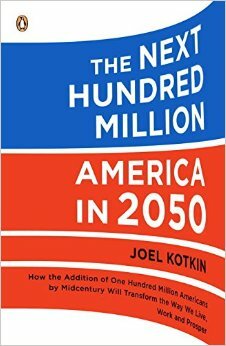 Kotkin’s latest book, The Next Hundred Million: America in 2050 was recently released. As the title suggests, this is a future look at the United States, rooted in the impact of the arrival of one hundred million new residents by 2050. This projection, by the way, is simply the Census Bureau’s medium scenario projection for US population, not anything proprietary to Kotkin. I won’t go into detail on book. Suffice it to say that the suburbs and Houston continue to feature prominently. However, the writing style largely avoids the “op-ed voice” in favor of a more traditional journalistic narrative. This, I think, allows one to get a more clear picture of Koktin’s views without getting hung up on incendiary rhetoric. I’d recommend reading it for yourself. Many would disagree with his unconventional views on many topics. I certainly don’t agree with everything he says. But I’m confident anyone reading it with an open mind would find it interesting – and even have parts they agree with. And I think we all benefit from being forced to engage with ideas that are contrary to our own. I do, however, want to examine some of Kotkin’s predictions about what he calls the Heartland. Among his contrarian notions is that the Heartland, far from being consigned to the scrapheap of history by economic change, is actually poised for a rebound. He devotes an entire chapter to this theme of Heartland resurgence. Kotkin doesn’t define his Heartland geography, but it appears to be mostly a combination of the Midwest and Great Plains. While it clear that he’s mostly focused on the Great Plains, an area he previously called the “zone of sanity,” a lot of his logic applies to the Midwest as well. Kotkin’s prediction comes from both demographic growth and structural economic changes. On the demographic front, the US is poised to grow its population by 1/3 or 100 million people in the next 40 years. This begs a very simple question: where the heck are we going to put all those people? Regardless of whether in some sense it is the preferred destination, the Heartland is where a significant number of them are going to end up. In Flatland, which occupies the middle of the country, it’s easy to build houses. When the demand for houses rises, Flatland metropolitan areas, which don’t really have traditional downtowns, just sprawl some more. As a result, housing prices are basically determined by the cost of construction. In Flatland, a housing bubble can’t even get started. But in the Zoned Zone, which lies along the coasts, a combination of high population density and land-use restrictions – hence “zoned” – makes it hard to build new houses. So when people become willing to spend more on houses, say because of a fall in mortgage rates, some houses get built, but the prices of existing houses also go up. Reading this made me think again of California and Texas. While Kotkin doesn’t make this claim in the book, another way to look at the California population flatlining vs. the growth of Texas is as simply an artifact of this housing dilemma. You can’t grow population easily if you can’t grow housing supply. Places like Texas take off because of both the lumpiness of migration due to network effects and such, as well as greenfield economics. What Kotkin does believe is that the Heartland is positioned to capture some of this market, and with projected market growth of one hundred million, it isn’t hard to imagine it figuring out how to grab at least some of it. There’s a tendency in all of us to simply extrapolate trends onward into the future. But things are seldom so predictable. Even 20 years ago, would anyone have predicted our world today? Perhaps that inherent unpredictability of the future is one of the reasons we in the greater Midwest should retain hope for the future. As a bit of a contrarian myself, I can’t help but observe that often when negative sentiment is the highest, that is sometimes the marker of an inflection point. As they say on Wall Street, until the market reaches the point of “capitulation” in a downtrend, it is tough to turn around. This makes me think of pieces like Ed Glaeser’s, “Can Buffalo Come Back?” He immediately answers his own question in the dek, saying, “Probably not–and government should stop bribing people to stay there.” Glaeser’s logic is based on a type transportation determinism. Buffalo existed for the era of water transport, that’s over, ergo Buffalo no longer has a raison d’etre. But there’s a big difference between telling hard truths, recognizing that we can’t adopt a “no casualties” policy, and simply writing off a large chunk of America. When I read articles like Glaeser’s, Buffalo implies much more than just that city. It seems to be a sort of shorthand for the whole Midwest apart from a few favored locales like Madison. But while there are changes in transportation and the economy that have undermined and are undermining this region, there are others that offer significantly more hope. For example, population growth + permissive zoning can equal picking up a reasonable sized chunk of an expanding market. That’s what Krugman implies and Kotkin argues. Kotkin’s demographics also give reasons for optimism even for the Midwest’s urban cores. Even he estimates 15-20 million new urban dwellers by 2050. Consider this: that range is equal to the populations of New York City, Los Angeles, Chicago, San Francisco, Boston, Seattle, and Washington – all combined. Given the prices and development constraints in those cities, even a low estimate for urban growth like Kotkin’s shows an incredible opportunity for Midwest and other cities to capture new residents. The supply of urban spaces simply isn’t enough to meet the projected demand. If Midwest cities are able to field a reasonable urban product – currently a challenge to be sure – then there is reason to believe they can capture part of this growth as well. And keep in mind, this is Kotkin’s prediction. If people who take a more optimistic view about the preference for living are right, the potential market for new urban residents is much greater – giving even more room for optimism. This the beauty of trying to reverse decline in a nation with strong population growth. In Europe, post-industrial regions in Germany and Eastern Europe will face a much tougher time since they face an environment of population stagnation or decline, even with the immigrants they are already having trouble integrating into their societies. Demographics also play a role in Kotkin’s prediction that agricultural expansion will play a role in the Heartland’s change of fortune. The world as a whole is going to add something like three billion people in the next 40 years, and those people need to eat. With the largest quantity of arable land in the world and them most productive agricultural industry, the United States is poised to grow output significantly. The Midwest is the epicenter of this. Kotkin notes that from 2002-2009, for example, the number of farms increased by 4%. The growing popularity of organic products has opened new market opportunities for producers, and organic farming is now one of the fastest-growing segments of US agriculture….This phenomenon has tremendous long term potential for American farmers…At the same time, community-supported agriculture – in which farmers sell directly to individual or groups of consumers on a regular basis – has emerged as a new model of food production, sales, and distribution, aimed at heightening both the quality of food and the quality of care given the land, plants, and animals…The rise of smaller-scale agriculture, more specialized and more closely linked to urban consumers, offers a glimpse into an emerging future for the Heartland. The shift to alternative fuels should be encouraged…Over time biofuels will create new jobs, increase commodity prices and farm income, improve the country’s balance of trade, and reduce our dependence on imported fuel and chemicals. These products will likely expand well beyond corn-based ethanol and towards other, perhaps more sustainable nonfood fuels based on wood and agricultural waste in addition to switchgrass….The Heartland is well positioned also to play a greatly expanded role in the development and implementation of new energy solutions. The Great Plains have been referred to as “the Saudi Arabia of wind;” North Dakota alone could eventually provide enough win power, by some estimates, to supply 20 percent of the nation’s electrical needs. Also on the economic front, Kotkin sides with the notion that longer term the Internet will level the playing fields for the Heartland, allowing even specialized production to occur anywhere. While certainly the highest value activities will continue to be concentrated in places like Silicon Valley and New York, that still leaves plenty of opportunity for the Heartland to both capture other parts of the value chain, as well as to develop its own indigenous companies. Kotkin cites an impressive list of places and firms ranging from Renaissance Learning, a software company that employs 700 people in Wisconsin Rapids, to Great Plains Software in Fargo, now part of Microsoft but still employing over 1,000 people locally. He also noted the trend towards more use of onshore outsourcing, a trend I previously discussed at length. The book doesn’t even scratch the surface of this phenomenon. I think about things like the internet marketing cluster in Indianapolis or the emerging “Tech Belt” between Cleveland and Pittsburgh, where initiatives like the wildly successful Youngstown Business Incubator are gathering national attention. The plural of anecdote isn’t data, and it’s clear the Midwest has a long way to go in transforming its economy. But it is still early days. The success stories in the region suggest that it is possible to develop technology businesses in the Midwest. The question is whether that can scale up over time or whether it will end up constrained by talent or some other issue. Time will tell. From an economic point of view, immigrants have transformed dying places into enlivened ones. Where small stores had once been languishing, there are now Latino markets and restaurants. Rural Wal-Marts offer yucca roots, tomatillos, and tripe. Communities like Lexington, Nebraska that were otherwise losing families, jobs, and workers now feel tensions but also a sense of a future. “I can remember when every house on the street was for sale except ours and our neighbor’s,” recalls Barry McFarland, a local resident, reflecting on how much has changed due to newcomers. Will Kotkin be right? Any look into even the near future, much less 40 years out, is certain to be wildly wrong in many respects. But with all the doom and gloom about the future of the Midwest, it is nice to read someone who has something positive to say, and provide a multi-faceted look at why this region can be successful if it gets its act together. A growing Heartland population, with more immigration, agricultural and energy growth, onshore outsourcing, high tech, and recreational amenities. If nothing else, this is one Kotkinesque prediction that I think many could at least hope comes true. Great essay full of various points worthy of their own discussion. I’ll try to stay focused on Kotkin’s projection. In short, I think he’s right. Lurking below the alarm-sounding of “Hollowing Out the Middle” are a few promising demographic trends. The long decline of the Heartland is beginning to remind me of the Reconstruction South. Furthermore, the turnaround can found to the north in the Canadian prairie provinces. Kotkin provides an alternative narrative to Richard Florida’s nascent fatalism. Kotkin is the much more forward-facing of the two public intellectuals. Kotkin might be wrong, but he’s going about the future-casting in the right way. Florida is merely describing the current (now receding into the past) economic geography. Honestly, I think Florida and Kotkin are a lot more alike than either would care to admit. Both have the ever-optimistic booster mentality, with the dark side being that areas that don’t feature in their growth-growth-growth ideas have to die. In their view, recessions only really exist to validate their points of view: Florida’s decided that the current recession shows how the future of America is in megaregions, and Kotkin’s one of many conservative polemicists who make Texas versus California comparisons and pretend that they point to a national trend. As I understand it, our future population growth IS immigration and the offspring of immigrants. They will come if there are jobs. They won’t create demand for more housing without the jobs. If there is economic/industry growth in the Heartland, such as in agriculture or energy production, it will be interesting to see how that housing happens. I recently watched the Charlie Rose interview with Brazilian billionaire entrepreneur Eike Batista where he briefly spoke of building villages to house people working on his oil drilling business. Something I’d like to look into further, to see what he’s doing. Joel was on Talk of the Nation on NPR just a few days back talking about this book. Kotkin may not be wrong. But there’s no reason to think he’s right. The flaw in his argument is its air of inevitability. Because the coasts are crowded and expensive, and because the Midwest has room and is cheap, therefore the Midwest’s recovery is preordained. Whoopee. Were that it were so. As you say, there’s a big difference between telling home truths and writing off a big chunk of the United States. My point is not that the Midwest is doomed to wallow forever on the wrong side of the American tracks. But I do say that this will happen unless we create our own renewal and, despite what Joel says, this isn’t inevitable. We’re about 30 or 40 years into the bad century that seized the South, between the Civil War and its Sun Belt revival. The South revived partly because it was there as a low-cost alternative when Midwestern manufacturing began to be uncompetitive. But the South wouldn’t have revived without some major changes — part technological (air conditioning), part social (an end to Jim Crow) — that made it a civilized choice. It also reformed itself as a region, behind the leadership of the Southern Growth Policies Board and other initiatives. My point is that the Midwest has to be on the technological spearpoint. It also has to recover the knack of innovation, reform its governance (see my blog today at http://www.globalmidwest.org), find financing, revitalize its education. Then maybe it will revive, as Kotkin predicts. Otherwise no. Kotkin doesn’t seem to see this solution. Instead, he seems to see the Midwest as a low-cost alternative, a destination for people who can’t afford to live anywhere else. This turns us into America’s trailer park, a refuge for the poor, uneducated and unskilled who come here only because it’s cheap. As Ed Glaeser has pointed out, this is pretty much why cities like Detroit haven’t vanished. They continue to draw people who go there because they’re too poor and unskilled to live anywhere else, guaranteeing that the city itself remains poor and unskilled. If this is the Midwest’s future, I’m underjoyed. Cheap housing through urban sprawl may be a solution, but only if the price of gas doesn’t go through the roof. Kotkin seems to feel that cities are as crowded as they’re going to get and there’s no place to put those 100 million extra souls except in Buffalo Commons. Wanna bet? The whole world is urbanizing. This trend may halt, but it probably won’t. Alternative fuels are indeed a key to the future and the Midwest is well placed to benefit from this. But production of biofuels, wind power, solar power, etc., doesn’t create many jobs in itself. You can turn all of North Dakota into a wind farm without adding jobs. This energy can power the real industries of the future, but that depends on technology to store and transmit energy from North Dakota to places where people really want to live and work. Immigrants definitely are keeping many small Midwestern farming and meatpacking towns alive. But enlivened? The jury’s out. Storm Lake, Iowa, owes its survival to two big meatpacking plants. But Storm Lake also has the lowest per capita income of any Iowa county seat outside the impoverished southern tier along the Missouri border. Finally, only someone from California could see sustainable agriculture and organic farming as a civilization-saver. The number of small farms indeed is growing, mostly to serve farmers’ markets and restaurants in the cities, but they remain a miniscule part of American farming. Megafarms — 2,000 acres or more — also are growing, because we know how to produce more food with less labor. Foodies like Michael Pollin and Alice Waters may decry this factory farming, but the nourishment of billions of persons around the world depends on these yields. So Midwestern agriculture definitely has a future as an industry but, alas, not as a source of jobs. If the Midwest revives, it will not be due to the demographic inevitability that Joel discerns but because Midwesterners make it happen. Like Aaron, I appreciate Kotkin’s counters to the fashionable group think that emerges in the urban planning world. What the discussions here and on other economic development / planning blogs over the past several months has really brought to light is the enormous market making capabilities of our Federal government through policy and direct investment. dictate the pace of redevelopment, which could in many instances take decades. Or, they could use “market making” public investments to create new features, amenities and incentives that attracted private sector investment, and thus speed along the process. I think the Midwest as a whole faces this same choice. There are no doubt “free market” forces that have been very challenging for the Midwestern cities to counter. For example, many coastal locations (and others like Boise, Denver, Boulder or even Las Vegas) that have experienced growth over the past several decades have benefited from the advantages of better weather or more compelling natural resources, or both. But they have also benefited from many market making forces at all levels of government, whether it’s policies to keep taxes low or incentives to attract key industries. Similarly, the Midwest has in many ways been the victim of government policies such as NAFTA that have helped facilitate the exodus of living wage jobs and, especially, transportation policies that have kept fuel prices low and created our expansive highway system. Walmart could not exist without these market making interventions. The Midwest continues to face many placemaking related challenges that must be addressed in order to attract and retain creative class types and others who have the resources to pick and choose where they want to live. But I think we also have an even greater challenge of regaining control of our Federal government’s market making prowess and redirecting efforts to retain our existing industries, build new ones, expand the number of good paying jobs and generally reverse the 30-year trend that has seen the real wages of our middle class decline to the benefit of those in the upper one percent income bracket (as per Elizabeth Warren). I am glad to see a new consensus emerging in the blogosphere that globalism was not some inevitable natural phenomenon, but instead a product of highly motivated global corporation interests facilitated by Federal policies and the benign acquiescence of naive voters like me. Without the good jobs and corresponding tax resources, communities will not have the public resources needed to invest in the strategies that create better places with more attractive quality of life amenities. Even before the current economic crisis, Midwestern cities large and small had little financial flexibility to make much needed public improvements to their downtowns and roadway corridors. Today, the situation is much more dire. And, so, my take is key issues in the decade ahead for the Midwest (and the rest of the country as well, really) will revolve around the “Market Wars”–the battle to control our Federal government’s market making prowess via policies, investments and who gets to be first in line at the public feeding trough. In many respects, the current economic crisis and the demise of the public option in healthcare reform have helped to clarify how challenging it will be regain control of the political process. But, if meaningful reforms ultimately occur as a result of a newly mobilized electorate–reforms that leads to significant new Federal investments in Midwestern market making endeavors–then perhaps the suffering of the past two years will prove to have some value after all. To be clear, I don’t include you in the list of people who’ve written off the Midwest. I intended to draw a distinction between those who don’t sugar coat painful issues but still think there are things we can do, and those like Glaeser who seem to think it’s pointless. I don’t think Kotkin believes this is inevitable in some Marxist sense. It’s just a prediction. For me the key is that we’ve got an expanding market with very healthy growth. Thus, if we get our act together, it isn’t unreasonable to think we can at least get our fair share. Naturally we still have to execute, and there’s much work to do. The agriculture angle is an interesting one. So much of this is just a matter of perception. Consider that when people talk about Portland and other places that are desirable, we always hear about things like microbreweries or cutting edge fashion or some such. We’re told Portland had 25 microbreweries, making it #1 in America. But microbreweries are economically irrelevant from a jobs perspective. That’s not a real industry. Yet it is still considered a positive in other ways for those cities. When it comes to local, organic, and sustainable agriculture, the Midwest is positioned to be among the top locations. There is no such thing as sustainable agriculture in California, as they are almost totally dependent on irrigation. If local small farms only supply farmers markets, high end restaurants, and specialty food stores, that doesn’t mean it can’t play a big role in changing the perception of a place and creating the type of amenities needed to be attractive. The Midwest is never going to be a fashion capital or anything like that, but it can be the epicenter of sustainable agriculture. Further to Aaron’s comment above: yes, factory farming feeds the world. It’s probably the Midwest’s lone competitive advantage in production, and it does create jobs and research positions in equipment manufacturing, seed engineering and production, transportation, meatpacking, and value-added processing. Non-factory agriculture does produce value-added, and jobs, in the same way that other neighborhood businesses produce jobs: a few at a time. Typically it’s a lifestyle choice for the owner. The demand exists, and what is missing (so far) is the local/regional sourcing/supply/distribution infrastructure. It is harder than it should be right now to find “local” products because of the missing middleman, but once the business graduates from Farmers Markets to a less hit-and-miss supply chain, watch out. A whole different note: wind energy and fresh water are abundant in the Midwest. Wind energy in Indiana and Michigan makes a whole lot more sense than wind energy in North Dakota because we’ve already got close connections to the grid here and plenty of demand. The availability of lots of water (both surface and groundwater) makes storing energy easier, too: pump water uphill into tanks, towers, or reservoirs whenever the wind blows and the grid doesn’t need power. Then run the water back downhill through generators when more energy is needed: mini-hydro power. Better yet: local clean power in a region dominated by coal-burning power plants. Best: very cool, very green. Better than micro-brew to attract cool, green people. Indianapolis: Cultural Trail, bike lanes, locally-produced organic food and maybe soon, cool green electric power and better transit too. How long until the Creative Class arrives in droves? 😉 At least there’s hope. Wind energy is promising, especially in a carbon-taxed world. But if I’m not mistaken, solar is a much larger source of renewable energy nowadays; it’s also much easier to build at any scale, because it can be placed on the roof of a house. It is harder than it should be right now to find “local” products because of the missing middleman, but once the business graduates from Farmers Markets to a less hit-and-miss supply chain, watch out. A lot of the organic farmers can’t (or won’t) scale. Even the farmers admit this. Some proudly boast of this fact. The big issue with the supply chain is the onerous pressures placed on them by mass merchandisers. It’s not just Wal-Mart that has its thumb on the scale. The Walton gang adapted the technique from supermarkets. Mass merchandisers order in enormous lots and for very long contract periods. Also, they can impose transportation and inventory costs on their suppliers. Plus, many growers must also contend with prices established by commodities markets. Farmers markets were in part a rebellion against the mass marketing game. Besides the old-time notion of customers meeting the people behind the produce, smaller growers like the fact that they are able to have more control over their prices and businesses. Wad, I think that what cdc is saying is similar to you: we need to built out the whole value to chain to make this work. The traditional models won’t work, though I should note that even more normal supermarket chains are starting to carry specialty type products. The fact that so many people want to remain micro-scale is actually great for the Midwest. While we’ve got some of those producers, I think we’re more likely to take a pro-scale business. Traders Point Creamery is a great example. That one dairy operation alone employs 50-75 people. Not huge to be sure, but those are real jobs. It doesn’t help the midwest that Chicago is the only game in town. The west coast has LA, SF, wine country, mountains, Vegas, Reno, San Diego, Tijuana, Portland, Seattle, and even Vancouver. The east coast has New England with its beauty, Boston, NY, DC, Philly, and Atlantic City. For the midwest, Chicago plays the role of NY, Vegas, Philly, Boston, Atlantic City, and Tijuana all wrapped in one package. Nice and all, but I’m sure even a great city like Chicago gets played. The midwest needs more game in town. I 100% disagree with Mr. Kotkin. There is no reason to believe that people will disperse to the midwest, the proof is in the pudding–look at trends up till this point. I line my thinking more with Mr. Longworth. If the midwest wants to come back, it has to do so by its own merit. It’s far from a slam dunk. The bottom line is that the most of the Midwest likely isn’t too thrilled with new people coming in on that scale or making a real commitment towards the better linkages they would likely want and need. How much real effort from inside the region is really going into creating a high speed or even low speed rail network connecting into Chicago? From what I can tell, most of the proposed stuff needs a lot of state funding. Richard talked about things like a regional newspaper, but really one is very lucky to have a few web links that cross state lines. Even deeper is a general ambivalence or worse towards immigration– or really bringing any new people in. Honestly, I really think many Midwestern cities would do well by opening up a few small storefront “embassies”, in big cities like NY and LA featuring some local products and pictures of available real estate. How likely is this? The prime thing that the Midwest needs is an aggressive policy to attract– high skill, immigrants, the kind of thing Canada and Austrailia are doing as far as I know. This crowd will be harder and harder to attract and one wonders if they will be comming to the US in large numbers. On a positive note, many, if not most of these people don’t come with the kind of anti urban biases a lot of American’s have. The amount of Queens real estate swooped up by asian immigrant investors in the last few decades is amazing. TUP, you are way too much of a Chicago partisan. “The only game in town” is quite a stretch, particularly since Chicago itself isn’t even growing very much. If you measure cities by actual demographic and economic data and not just by how many skyscrapers got built, there are plenty of Midwest success stories. Des Moines, Iowa is one of the strongest metros in the country, and despite the purported challenges of luring people to Iowa has the fastest population growth of any Midwest metro over 500,000 people, far exceeding the national average. Madison is also very strong. Cities like Indy, Columbus, and Kansas City may not look like what you’d want them to, but they are doing well on most performance measures. There’s no doubt the Midwest has a long way to go and has to make its own future. It’s not going to be easy. But the idea that Chicago and only Chicago has it figured out is just wrong. Richard Longworth wrote: “Cheap housing through urban sprawl may be a solution, but only if the price of gas doesn’t go through the roof.” I see people write similar comments all the time on urban blogs. Has anyone ever heard of telework? I know not all jobs qualify, but many do. The high-speed connection technology is already in place on the edges of many urban areas, the only thing holding it back is management attitude. In my firm, management would not consider it until the gas price spike in 2008, then they got enough complaints from employees that they started letting people “work from home” two days a week. Now they’re cutting their office space costs by renting smaller office areas and making people work from home 3 days a week, so multiple people can share the same cubes when they do come in to the office (“Hoteling”). If gas prices spike again there will be more of these kinds of policies. I never really need to go into an office for my job. Again, many jobs do need to be done onsite, but if even 1/3 of jobs can be done remotely, that still leaves quite a number of people who can afford to “sprawl”, especially if they’re plugging an electric car (for local trips to the store and such) into a grid that’s powered by wind, nuclear, or some other alternative energy source. My point being that we should watch our assumptions that high gas prices=an end to sprawl. Maybe, maybe not. TUP, look at your list of east coast cities and tell me where they were 30 or 35 years ago. Atlantic City was “the slum by the sea” – I grew up in South Jersey in the ’70s and NO ONE went to Atl. City. NYC was bankrupt. Philly was a historic district surrounded by decay (I’m not sure it’s all that great now, but better than it was anyway). All of those cities were run by corrupt machines. The Northeast’s time had passed, the future was in the South, Texas, and California. If those crumbling, bumbling cities could get it together, so can various Midwestern cities. And of course it’s going to take effort, but at the very least there are a number of truly outstanding universities spread around the midwest (U of Chicago, WashU, Carnegie-Mellon, Northwestern, Michigan, Wisconsin, Case-Western, Notre Dame, Carleton, Oberlin, Grinnell, etc etc) that should be able to help out a bit, one would think. First of all, one needs to be honest about the effects previous government “investments” in the region, which were hardly about “placemaking”. Trillions in today’s dollars were spent on highways and government roads and other projects. Second, one needs to admit that often there was a substantial amount of demand to live in these places. Mindy Fullilove lists almost 2000 separate communities wiped out by urban renewal efforts across the country. 8,000 people and many businesses existed in the lower Hill in Pittsburgh. Funny how the cities most viable area, The South Side wasn’t lucky enough to have missed these government investments. Third, the country is broke with a capital B. Honest accounting would list 75 trillion or more in unbacked promises. Yes, some money for capital projects might be available, if we were able to be honest and make realistic choices. The way things are now, two thirds or more of the budget is taken up by auto piloted entitlement programs and debt service. Keeping the highway entitlement program alive takes up a good chunk of the remaining cash. This is also, a pretty inaccurate. A whole lot of “creative class types” like artists, and young people thinking about creative new businesses are often cash poor. Aaron has mentioned a few times how hard people who really can’t afford it try to stay in places like Portland. The core thing, I think a lot of these people want is a level of freedom, and perhaps influence. Pittsburgh, being a college town has lots of them, who at least think about staying around. The big problem I hear from them is that the city itself is not to interested in their ideas and input. Time after time we have seen small businesses that invested in the city be forced out by a “private public partnership” of government thugs and select insider “businesses”. Ooops, here was my full comment. Ziggy, you take the prize so far for producing a comment that’s almost 100% inaccurate. I just want to make one more point. A really, really big issue nobody has mentioned is the motivation behind a lot of home purchase decisions. We are likely to have more data to make conclusions in the next few years, but it looks like a lot of homes at least along the coasts and in the southwest were purchased as investment as the primary goal. We are starting to see the tip of a “walk away” iceberg as lots of high end buyers with negative equity decide to bail on these investments. Honestly, it looks like a lot of people bought certain types of homes because they saw other people buying them and of course because this is what one could get loans to buy. Aaron, if I sound too Chicago partisan it’s because I probably am. However, that is only half the truth. Many of the midwest’s (and America’s) greatest failings can be observed driving the streets of much of Chicago’s south and west sides–I fully recognize that. But that’s for another discussion. Here is my point: I am likely never going to have the kind of time to analyze this in depth (citing tax policies, lessons from cities throughout the world, quoting various sources about urban issues, knowing what kind of farming works and where, etc…). I know. I did the interview trail a couple years ago and, believe it or not, the guy interviewing me in St Louis actually spent a few minutes talking about how lame St Louis is. Of course, he is wrong because my brother lived there for 3 years and I found it to be a great & underrated place. Probably Chicago and, to a lesser degree, Minneapolis are the only places where people actually have an unusual degree of pride of where they’re from. That sense of “place”, ie “I’m from here”. I can point this place out to you, show it off, and tell you that I live in this great place. Sure, Indy and KC and perhaps some other cities may be, on a percentage basis (obviously not in absolute numbers) growing faster than Chicago and doing better economically, but that’s not what this discussion is about. Aaron, if so many of these cities are indeed growing so quickly, then why are we even having this discussion? Clearly that is enough evidence that the heartland is NOT in the doldrums. Yet lament we continue to do. Why? Because most of the growth, as we all know, is in that shapeless, formless, placeless exurban growth boundary that looks the same whether it be in California, Iowa, Ohio, or Pennsylvania. So let me ask you something–what are we actually trying to ACHIEVE in the midwest? Are we trying to just achieve population and economic growth? If so, then isn’t Aaron saying that we’ve already done so? However, if we’re actually trying to achieve a sense of place, a magnet for higher paying jobs, a place to be proud of and to attract outsiders, I am saying that despite all of its shortcomings, Chicago is the midwest’s model to accomplish that. Chicago may be experiencing a net domestic outmigration; so what’s new? So are New York and LA, the two places that we “heartlanders” in this discussion appear to covet to begin with. But the key is, it manages to attract the best and the brightest, and more importantly, people are actually willing to move from the coasts (and abroad) to live there. The answer is right under our nose, yet Kotkin, in several of his articles, seems to loathe the place! John Morris – I guess my windy post failed bring home my key points. 1) Governments help make markets, and do so in a big way. They may in fact be the single most important influence on many important markets. Housing for example. Our Interstate highway system helped to enable suburban growth for better and for worse. This may not be “placemaking” to your liking, but placemaking indeed it is. I worked on a student planning project in China five years ago. Their government is going to build a city of several hundred thousand people in place that is now (or was then) duck farms. I’m not even going to start in on the markets currently being supported by our defense industry. 2) Globalism at the scale now practiced was not inevitable. It was facilitated by government policies that exacerbated the off shoring of good paying manufacturing jobs. This has tended to benefit only a relatively small number corporate shareholders, and especially those in the highest income brackets. It’s been especially harmful for the Midwest. When I read about Detroit’s “inevitable” decline, I think, “Wait a minute.” When our banking system failed, suddenly there was a trillion dollars available to help prop up our financial markets. So, where’s Detroit’s trillion or half-trillion? How come Goldman Sachs, Citi and Chase rate, but the good suffering residents of Detroit do not?” The same is true for other hard hit Midwestern cities. I’m not talking about permanent life support here. I’m talking about funds for education, training and enhanced quality of life amenities that help places compete for talent, resources, prestige, visitors and investors who have choices. 3) Regardless of government’s market making capabilities, there’s also a “free market” dimension that must be addressed. Many people, especially those with college educations, have the wherewithal to pick and choose where they want to live. Peter Wolf wrote 10 years ago in his book “Hot Towns” that this population may include as many as 1 million people moving per year. I know migration numbers are down due to the economy, but the point is that qualities of place–especially appearance–matter, and they matter a great deal. Telecommuting is a distraction. It doesn’t happen in significant numbers in countries where gas prices divided by income are several times as much as in the US, due to lower incomes or high gas taxes. Why should it happen in the US? More likely, a prolonged oil shock will make people switch to small cars, take fewer discretionary trips, and ride mass transit more. The model of people going to nearby office clusters doesn’t work, either – job markets aren’t so flexible as to let people choose which neighborhood they work in; that’s why decentralized office space leads to edgeless cities, where people drive from one suburb to another. Canada and Australia’s experience with immigration is that immigrants settle near the big, multicultural cities. Canada has few immigrants outside the metro areas of Toronto, Montreal, and Vancouver, despite government attempts to lure them to the rest of the country. Even the boomtowns of Calgary and Edmonton attract internal migrants, not international ones. I believe Australia is similar to Canada, with immigrants mostly clustering in Sydney and Melbourne. The smaller Midwestern cities’ population growth numbers aren’t very exciting, especially when compared to federal money flows. For example, Indianapolis and Chicago are both net federal tax donors, but Illinois in general is a tax donor whereas Indiana is tax neutral. This means that Indianapolis does not have to subsidize the rest of its state as much as Chicago does. I’m pretty sure that once you look beyond the CBD of Des Moines, you’ll find the same thing; Iowa consists of government-subsidized cornfields, plus one city where the primary industries are built around servicing said cornfields. Color me unimpressed. At the same time, it’s really not true that Chicago is SF, LA, Reno, and Vegas all at the same time. For one, there’s nothing like Nevada in the region, which, given Nevada’s current economic climate, is a good thing. More to the point, the smaller cities of the Midwest have different mythologies from the smaller cities of the West Coast or Northeast. Detroit isn’t Portland; it’s Detroit. The only difference is, Detroit’s mythology goes further back in history, so now that it’s being shattered more people are talking about it. I agree that Telecommuting is one of the most over hyped non trends going. There are already really long commute times and fairly high fuel costs not to mention snow. If it was that easy and practical it would be a big factor by now. I also think, international immigrants have tended to stay near mega cities, but this is a somewhat elastic thing, Most of the Midwest is flat, and with good transport the definition of a metro area can grow. Chicago/Milwaukee/ Madison is almost one metro area. Immigrants to the US tend to cluster, but less so than in Canada. On top of it, the trend is toward more immigration to areas outside the traditional immigrant areas of New York and California. There are immigrant workforces in meatpacking plants in North Carolina and Iowa, and large and growing immigrant communities in Texas, Florida, Arizona, and Greater Chicago. It’s not like in Canada, where immigrants stick to Montreal, Greater Vancouver, and Greater Toronto. OK, maybe telecommuting is the “biggest non-trend out there”, maybe it was over-hyped. That doesn’t mean it can’t or won’t happen going forward. It is easy to do for certain workers – the biggest problem at my company was management intransigence toward the idea (“we won’t have control!”). If that continues, then I guess it will continue to be a non-trend, I’m stating that it was never considered where I work until the oil price spike two years ago. I’m guessing there will be more of it if there is an extended rise in oil price in the future. Maybe I’m wrong. But the bigger point is the apparent assumption that rising oil price means an end to sprawl. Alon says people will turn to smaller cars and mass transit. OK, so they lower their fuel costs and how does that stop the sprawl? John says people already have terrible commutes and snow and high gas prices. And it hasn’t stopped the sprawl. I do agree that higher gas prices are likely within a couple of years, but can we stop assuming that this alone will magically end sprawl and send huge numbers back to the core, or that wide-ranging mass transit systems will be demanded, and built, in response? That might happen, I just think it’s going to take a lot more than higher fuel costs. Dave, let me spell out my general prediction for you. Three major trends will likely interact, the biggest of which has not been stated here. First, there will likely be a trend towards higher oil prices, especially as the purchasing power of the US dollar falls. How big this trend will be is up in the air but the dramatic impact the 2008 oil shock had on the average American consumer implies that consumers cannot take it. Second, is that time dealys from traffic congestion will only get worse largely due to the third trend. Three. America will be a dramatically poorer country, strained at the local, State and Federal Level. Right now, road construction and maintenance comprises one of the biggest budget items out there, along with schools, healthcare and government pensions. We can see the problems in the Pittsburgh region pretty clearly where the regional population has both shrunk, aged and spread out. Allegheny county alone has I think, 300 bridges or something like that. Bridges across ravines, across rivers, big bridges and huge bridges– and then there are the tunnels. All of this infrastructure has aged in place and requires vast amounts of money to keep up. The region has a lot of the countries most unsafe, unstable bridges. Add to this the cost of dealing with the regular rock slides which commonly block roads. More and more communities face being cut off as the funds run out to keep their roads open. All across the country we see similar problems. One can point to a good a decent number of privately run transit lines that come fairly close to being self funding but an amazingly small number of roads. In fact, the whole sprawl “business model” seems pretty shaky and built more on abandoning communities to escape legacy costs than anything else. Tons of even very wealthy suburban communities are under tremendous financial stress. I think one can see how these three trends can interact to reinforce each other. Gas prices rising will hurt people’s ability to pay the taxes or tolls for infrastructure. Failing infrastructure causes more delays. Dave: I think the answer to your question is, it won’t stop the sprawl, and it won’t have to. The mostly car-free European urban areas, such as Amsterdam and Copenhagen, are denser than most US urban areas, but they don’t exactly look like Hong Kong. The reason I’m skeptical about what an oil shock will do is that with less driving and more transit ridership, the trend is observable. In countries with higher gas taxes than the US, the VMT per capita numbers are lower than in the US, transit ridership is higher, and cars are more fuel-efficient – precisely the three trends that could be observed in the US in the last decade as gas prices rose. Thanks for your replies Alon and John. If John’s rather dire economic prediction comes true I guess there won’t be much development of anything in coming years in this country. I’m a touch more optimistic than he is, but who knows? Alon, I would love to have a mass transit system like they have in many large cities of Europe, but my understanding is that currently only New York and Chicago have anything approaching that. Maybe a few cities that have a sort of half way system could get there with more investment (Boston, St Louis, DC, SF, Philly, perhaps?) but most places would have to build it almost from the ground up, unless I’ve missed something. As always the question is “with what money?”. The sketchy little “GRTC” here in Richmond just had cutbacks due to budget issues. The hope is in what I think you’re hinting at, that people’s attitudes are changing about city life in general, and thus also about mass transit – especially among younger people – and higher costs of living farther out will help that along. Probably true. Let’s hope so anyway – it’s going to take that attitude or “worldview” change to get the political support necessary to build sensibly functioning urban systems in this country. Telecommuting is real and is getting bigger. And the main driver of it is corporations looking to reduce costs. My previous employer effectively mandated telecommuting during parts of the week in order to eliminate real estate in expensive downtown areas. This resulted in millions of dollars in annual savings. Almost all corporate talk about “flexible work environments” is really about cost reduction. This is speculation, but I also believe corporations want more telecommuting because this lets the current employee figure out how to make the job capable of being performed remotely as a prelude to outsourcing. Though I should say that much of the telecommuting today is part time, with people coming into the office X days per week or for meetings. TUP, I think a lot of it comes down to a person’s personal taste in development. Some may not like what Des Moines looks like, but that doesn’t make it any less valid. (Incidentally, while I haven’t done any in-depth research on Des Moines economy, I do believe it is a significant insurance center. I don’t think it is thriving just by selling tractors to fast-emptying Iowa farm towns). “Pride in a city” is something I wish more places had. But why do some cities have a bad image? Maybe its because that image is shaped in media centers populated with people who have contempt for them. Chicago drips with disdain for other Midwest cities. And civic pride isn’t an economic development metric either. At some point that has to turn into something. No one denies that Chicago is attractive to a number very high talent people. But can you sustain a region of 10 million people on that base? I agree with that completely. The kind of job that can be fully done out of ones home can likely be easily outsourced. What I meant by overhyped is that this is not so powerful a trend in itself to counteract all the other presures working the other way–failing infrastructure, fuel prices, rising commute times. As a full time fine artist in NYC, I worked at home, but had to be available for easy meetings or studio visits pretty much at the drop of a hat so there was a strong push to live as close into town as I could. I also think the residential/ work commute is given too much weight. The average seven or more Family car trips a day include shopping, school, kids sports and almost every other social activity. Even if most people worked almost entirely from home they would face lots of pressure. I mean, yes there will be a number of people who would be OK with reducing their lives to a weekly trip to the Walmart, but I think that’s a niche. I also strongly agree with Richard Florida’s spin about people needing the big, diverse job pools with many choices that cities offer. It’s really too risky to place one’s bet on one or two employers. Dave: what US cities need is good investment, not necessarily a lot of investment. Chicago is actually a good example of how not to do transit. The L and Metra are built to be incapable of serving any destination except the Loop. Their transfers are inconvenient, and they have redundant lines paralleling each other instead of lines providing service in different directions. Greater Chicago’s total rail ridership is about 250 million per year, or 26 per person. To put things in perspective, Hamburg’s comparable figure is 121 and Calgary’s is 75. Neither Hamburg nor Calgary has a large system by Chicago standards, but both made efforts to do it right, which means serving multiple kinds of trips. The problem is that American cities are converging on the failed Chicago model with their new light rail programs. St. Louis is a good example: look at the proposed map on The Transport Politic and ask yourself how useful such a system is going to be for crosstown trips. By the way: the average seven or more family car trips per day only work the way you say they do in areas that are hopelessly car-oriented. In urban environments, they’re replaced by two transit trips and five walking trips. As always the question is “with what money?”. There’s no shortage of money, per se. You need to establish a spending regime. Ideally, you want the money source as close to the spending area as possible. Your choices are sales taxes, property taxes, “value capture”, gasoline taxes, car tags, even income taxes. Your area has to resign itself to the facts that transit operations will never be profitable, and non-users are going to have to help keep up a system. Less desirable are state subsidies. Least desirable are federal subsidies. The problem with these are that the field of competition will be large, and some of the revenue is lost as “heat” (the carrying costs of the bursar bureaucracy are taken out of the subsidies your area gets). FTA money is an even bigger nightmare because the FTA essentially dictates how local transit agencies can spend the money. As for how to actually get a tax passed, I don’t have an answer to that. All politics is local. Then again, keep in mind that conservative or generally transit-resistant areas have been able to get transit investments passed. The key thing, is that transit has to be integrated with the whole design and structure of the city. I don’t mean marxist planners have to plan everything but one has to allow a city structure and density levels in which transit can work. For example, Pittsburgh is spending a half billion dollars to connect the downtown with the North Shore, which would allowed dense apartment, office, hotel and retail development to bring in tax money and keep the trains full. But this area, is occupied by a huge waterfront expressway, two huge and little used sports stadiums and tax subsidised parking garages making the project a massive waste of money. Some form of “value capture”, is likely the most logical and fair way to fund transit. MTR, owns chunks of land along it’s route and at it’s train stations. Ooops, this was my full comment. I use a spell check and screwed up. Some form of “value capture”, is likely the most logical and fair way to fund transit. MTR, owns chunks of land along it’s route and at it’s train stations. Other cities raise taxes in relation to how close you are to the transit line, which seems to make sense– providing one changes the zoning laws to allow property owners to build up. I agree strongly with Alon’s statement that this doesn’t always require that much money. In fact, places like Hong kong and Singapore made very wise choices because they were too poor to have money to waste. I’m not an expert on this but Bogota, Columbia is now a pioneer in low cost transit. What I mean is that Wad is describing how things operate in the U.S. today. However, you might have noticed that they don’t work very well and are likely going to have to be changed. I think we are in an important era of opportunity in which people are more open to new ideas and plans, if only out of desperation. My guess is that if you can build a real coalition among local businesses and property owners, you may be able to gain support for new ideas. Often the Feds only distort the system with misguided funds. The FTA, for example would only put money into The North Shore Connector in Pittsburgh over a host of other projects that were far more logical. I also think there are ways to start small. You can test out routes with buses. The better run and economically functional you are, the greater your potential freedom and independence from state or federal dependency and meddling. Pittsburgh, which is in de facto bankruptcy from city pension troubles isn’t really free to control a lot of the tax and parking policies that affect transit. A lot of recent developments with MTR Corporation, the Hong Kong Rail Operator. For years, it has talked of expanding and made several moves and bids to operate UK rail sytems. I don’t know the details of these deals. I think they all involve some state subsidy. But, as I said, in Hong Kong itself it makes a profit through real estate development. I think we really need to break the myth that mass transit can never, ever make a profit. It may seem unlikely, but depending on logical design and good operation–it is very possible. The guy in the video – William Lind – I don’t know much about, from what I read he seems a bit out there, but at least he has a reasonable view on transit and he says if you make the the right arguments to conservatives (e.g. the highway system is as subsidized as mass transit, just don’t mention global warming), they’ll listen. Hopefully. Alon, you’re right about the crosstown trip issue. Whenever I go to Chicago I am headed for the Loop on the “Blue” line from O’Hare, so I never really noticed that before. My sister ran into this in NYC metro as well – she and her husband bought in South Orange 20 years ago partly because it had a train line into the city on NJ Transit. Her husband’s job got moved up to Bergen County recently and now he has to drive. So, not being the transit expert that some of the commenters here are, how is transit built cheaply in dense urban areas? Are we talking about light rail? I can’t believe you mean 2nd-avenue subway type projects, which seem to take forever and I don’t believe are cheap. John, I like Pittsburgh and try to keep up, but I hadn’t heard of that North Shore project. Looking at the map, it seems its main purpose is to shuttle people out to the Rivers Casino, and maybe the stadiums (which is pointless in the case of PNC Park since part of the allure of seeing a game there is walking across the Clemente Bridge to the game!). Same question as with Alon, what cheap transit modes are we talking about? New subways never seem cheap, from my limited knowledge of the subject. Aaron, on your comment about telecommuting being a cost reducer, that’s what the managers at my company figured out after taking tentative initial steps because of the oil spike – they could save on office leasing costs. Now they’re moving a bunch (hundreds) of people in one of our buildings to a different, smaller, cheaper building and making them work from home 3 days a week, and share small cubes for their two days in the office. Off-shoring could follow. I suppose, I’m not an official expert either and I can’t speak for Alon. Cheap is relative, of course. When, I mean cheap, I mean in the relation between dollars spent and potential land development tax dollars, property value increases, increased retail sales etc… Of course if it’s done right, there are a lot of quality of life benefits that are harder to measure. As Alon mentioned earlier, a reasonably well set up medium density area results in half or more trips made on foot and requiring no cost beyond sidewalk maintenance. After that, one has a number of options, light rail, BRT, shuttle busses, trolleys and Subways. But, that T line was hardly a perfectly chosen route if one was looking for bang for the buck. It covers a number of miles, most of which has fairly low density housing, that was never fully up zoned. How much would it have taken to run a simple light rail line up and down From the Strip through the Downtown (say 30 blocks), allowing a high density mix of apartment, retail, and office development on land that now is covered with underused industrial space and parking lots. Even better would have been a somewhat longer line from Downtown through the Strip and Lawrenceville. The line to the North Side is a vast tragedy, that proves my point. Transit cannot be separated from larger issues of land use and zoning. If the Stadiums, highway and the blocks of parking structures (by the way, they can cost 30, million or more each) the stadiums require were not there, that line would have been a great investment, opening up that area to mixed use office, retail, entertainment, residential. This is very, very scarce flat land in Pittsburgh’s most valuable location. Wonderful views, waterfront park, small scenic bridges linking to the Downtown. If you’ve seen a game at PNC, you know it’s quite a spot! (OK, PNC alone might have been OK) Likely, this would have been a great investment, that would have reaped a lot of development revenue. If the line went further it would have linked the North Side’s struggling but beautiful areas like Manchester and The Mexican War Streets into the city. But there again, what’s the point. Unless one is willing to take the wrecking ball to Allegheny Center and the other car oriented junk that has so damaged this area. There are several grades of expensive. In Europe, subways rarely cost more than $250 million per route-km; typically the lines that go over that amount are those built deep underground to cross under rivers or older subway lines. The budget for the first phase of Second Avenue Subway works out to $1.7 billion per route-km. Both amounts can be thought of as expensive, but they’re not the same kind of expensive. Other US cities build subways at lower than New York cost, but would still rank among the most expensive cities in Europe. But the problem in most US isn’t so much high cost as low ridership. Second Avenue Subway is about four times too expensive no matter what. But the other $40,000/rider light rail projects in the US are not expensive by European standards in terms of cost per km; they just get low ridership due to poor planning. Usually this is blamed on low gas prices or sprawl, but Canada has almost as low gas prices as the US and almost as much sprawl, and still its rail lines get decent ridership, and cost less per rider than even the least expensive US light rail projects. I know of William Lind pretty well. He’s an acolyte of the late Paul Weyrich, one of America’s most famous (or infamous, depending on your politics) post-1960s movement conservatives. Lind is more famous for his military analyses, and as a conservative he voiced opposition to the Iraq war by arguing it was a tactical failure. Look up the term “fourth-generation warfare” or 4GW. Lind is one of a few pro-transit conservatives, but he hasn’t been successful in bringing his side around. For the most part, conservatives’ default position is the one of the think tanks, and the think tanks themselves entrust Wendell Cox and Randall O’Toole to do the dirty work. But, as I said, in Hong Kong itself it makes a profit through real estate development. In other words, it’s subsidized. In this case, it’s the investors of MTR stock and bonds, rather than the populace as a whole. It’s feasible in Hong Kong, because owning land there is a de facto license to print money. Second, Hong Kong is very wealthy and poverty is no obstacle to owning a car. The biggest obstacle is Hong Kong itself. A car is a sign of status, but its carrying costs make ownership and operation more trouble than they’re worth. Still, it’s doubtful that the transit component can generate >100% operation and capital recovery through the collection of fares alone. That’s the case where riders are really paying their own way. What works in Hong Kong won’t work in the U.S. We have too much undeveloped land, too many regimes that can make an end-run around value-captive land (suburbs can poach cities’ value-generating enterprises by dangling out lower costs), and we invest so much money and knowledge into the sale, operations and throughput of vehicle traffic. If we were to somehow overcome this, there’s one other problem with an MTR-like business arrangement in the U.S.: It’s illegal. Fiduciary duties are the cornerstone of American capitalism, and investors will have no tolerance for an unprofitable transit system on a corportation’s balance sheets that’s only taking away money that in the eyes of the law, is theirs. It does in Tokyo and Singapore, and I think also in Seoul and Taipei. And I don’t understand what’s illegal about a transit company owning real estate in the US. It’s not a prohibition of transit agencies owning land or ancillary for-profit businesses. The problem comes under the way the American investment world works right now. An American equivalent of MTR would be if, say, First Transit or Veolia were incorporated as an REIT. This REIT’s business model would rest on having an impressive portfolio of land holdings, as well as a network of highly patronized transit routes and government-granted powers including a franchise for the service area. Now, an REIT has a responsibility to distribute a set percentage of its earnings to its shareholders. Even this dividend is not much of a burden. The REIT/transit system does everything right: It controls its costs, it generates more revenue than it knows what to do with, and it even has a respectable debt outlook. So why would there be any reason that shareholders would be upset at this arrangement? Well, the financials show that the land holdings portfolio is several times more lucrative than the transit component. Its earnings growth is faster, far more stable, and its costs are lower. Worse, they could find that some of the profits from the land holdings are going to shore up loss-leading services in the transit network. If the shareholders think they can get a better deal by dismantling or spinning off the transit component, they have the right to make the company’s executives implement their decision. Management, though, has the obligation to carry out the investors’ wishes. It doesn’t matter if the transit component provides a necessary service or even that it’s key to ensuring the profitability of the land portfolio. If the investors don’t want their money going into public transit, the company has no choice but to obey the investors’ wishes. Previously, many transit lines were built by real estate developers who owned land on the edges of cities. The Lake St. L in Chicago was built this way. The biggest obstacle to the property development form of paying for transit is that the land is already owned by someone else in the private sector. It either has to be purchased or condemned. Although the Supreme Court has ruled that municipalities can use eminent domain for economic development purposes, there is an enormous stigma (rightly so in my view) and many state level obstacles to doing this in many places. Plus the existing land owners would likely secure such high compensation that it would adversely affect the economics of the project. I’m pretty sure MTR comes close to break even on the transit, and I’m hardly an expert on the company, but I have never heard of anyone separating the two businesses since it’s very clear how the connection works. Anyway, my hope and eventual expectation is that the government’s general lack of funds and the obvious success of transit related development around the world will get more people interested in linking transit and development. In the Midwest, a lot of transit lines would likely go through old industrial and underused infill areas like The Strip. At sub minimum, one should be able gain support for tax value capture near the lines. This is the general problem of government involvement. I mean, who even thinks about these things. Who really has an incentive to think of the economics of a line, or routes and costs. It’s just a political issue. Not too sure how up to date the Wikipedia on MTR corp is but it say’s MTR makes money on the fare box alone– although I think it’s a small amount. The Wikipedia entry also say’s the company is still majority owned by the Hong Kong government. My guess, is that this is still a bit of a political issue and that the company is under pressure to keep fares lower than than the market might allow. Wad, the real estate business is not “several times as lucrative” as the transit business. It’s a side business; most revenue for Asian transit agencies comes from farebox revenue, and most of the rest comes from ancillary transit revenues such as advertising and concessions. In either case, the real estate and transit businesses are mutually complementary – the transit services raise property values, and the real estate holdings generate demand for transit. John, the MTR is majority government-owned, but it’s run as a private company; at any rate, Hong Kong politics is literally plutocratic, and there would be no pressure to hold fares down. The government-owned company acting as a private business is quite common in some countries, especially Singapore and Dubai (not so much Hong Kong). In Japan there are some such companies, too, for example Tokyo Metro, but they tend to be companies in the process of full privatization. I’m willing to defer to you on that and I think your right. My guess is that given the density level in Hong Kong, the company would be able to charge more if it wanted to. Transit fare’s in Hong Kong are considered pretty cheap and a good value. (unlike almost anything else)In Hong Kong and New York, transit competes with walking on many trips. From what I’ve been reading, property development is hardly a side business. It’s a very important part of the whole company structure at least in terms of it’s Hong Kong operations. A) We have established that it is possible to make money on transit alone or at least break even on it and that a number of global transit systems either achieve this or come close. B) We can see the strong “mutually complementary” relationship between transit and urban type development. C) We can see that these relationships once existed in the U.S. and inspired the early American mass transit systems. I invite anyone to show any kind of mutually complementary relationship between large scale highways and urban type development. With transit, you pay for the transit and that’s it- period but with roads, one still has traffic issues, noise, delays and the need for vast amounts of parking– a cost most cities in the U.S. force on property owners with parking mandates or subsidize with tax dollars. What are the farebox recoveries, minus advertising, for Asian systems? Also, are figures broken down for rail and bus? I could understand how the transit and land holdings are mutually complementary. That is evident. By more lucrative, I mean is there a significant economic spread between the revenues, costs and profits of land and transit? This may not happen in Hong Kong or Japan, as even these private companies have governments involved with a vested stake in the financial success of both. A similar regime can’t be ported to the United States. America’s on the brink of another civil war over the trillions funneled into back-stopping the FIRE sector (and the automobile sectors). Even under ideal conditions, we have the fiduciary duty problem. If there is a significant spread between the land and transit units, investors want to seize that difference for themselves. Assuming that there’s no government interference — such as a franchise law or public-carrier requirement for favorable tax laws — stockholders are free to order a sale or reorganization of the business if they perceive it in their best interest. This is a very likely possibility. A similar scenario would have been the Pepsico reorganization. Pepsi, besides its drink line, had a slew of mutually complementary businesses: heavily salted snack treats and fast food. Pepsico shareholders decided that they wanted to get rid of the fast food business line. It was made into a new company, and the sale generated more cash for Pepsico. Now the fortunes of the two companies are separate. Both seem to be well-off. The logic at the time was probably that Pepsi fountains were a mutually complementary business to KFC and Pizza Hut. Seems logical enough. Yet when the fast food chains were spun off, Pepsico chose to take a sale rather than continue to collect revenues and liabilities. The one tie they share is that Yum Brands, the corporation that owns the fast food spin-off, has a lifetime contract to serve Pepsi drinks. The correlation is global, as the same effects are evident in MTR-like transit-development businesses. Yet just because transit and development are mutually beneficial, it doesn’t mean they have to be under the same umbrella unless they’re legally compelled to stay united. The split is likely to happen if the arrangement is a success or a failure. If successful, the shareholders may choose to split the company because they sense that either the transit or the land component would fetch a premium on the market and use the sale to bolster the remaining business unit. If declining, the shareholders may decide to cut the losses on a moribund unit by either liquidating it or finding another buyer willing to accept a lower return on investment. Land is almost always going to be the more valuable business unit than transit. Why? Real estate has a smaller and wealthier market of buyers, sellers and tenants. It’s easier to manage than millions of people who depend on you for mobility. Real estate also offers a better return on investment when accounting for expenses and risk. Also, real estate is more liquid. A property deed is easier to unload than a portfolio of stations, guideways and vehicles that have no other use but to provide public mobility. Then of course, there’s the danger of who gets to buy a public transit system. You can have a life-imitating-art “Roger Rabbit conspiracy” of competitors who only seek to enhance their position by eliminating competition. You can also see private equity funds buy the transit system. What happens when these groups come in ends up looking like an exurban McMansion after tweakers came looking for copper pipes and fixtures. The U.S. doesn’t really have a mechanism to prevent such shenanigans. Even if it’s a matter of making laws more favorable for private developers to also make money from transit, the easy availability of automobiles, the abundance of land, and legally sanctioned beggar-thy-neighbor competition among local governments makes such an arrangement unfeasible in the U.S.
Cost-management is the best we could do for at this time.